Discover how to add a Facebook account on your Samsung Galaxy Note II smartphone. Learn how to log out of Facebook on your Samsung Galaxy Note II smartphone. A visual guide on how to navigate Facebook on your Samsung Galaxy Note II smartphone. A visual walkthrough on how to post a Facebook status update on your Samsung Galaxy Note II smartphone. Here's how to turn pre-installed apps on your Galaxy Note II on or off. To view or close recently used apps on your Samsung Galaxy Note II, view this info. Here's how to remove or delete apps if your Galaxy Note II is unresponsive, freezes or an app won't open. Discover how to open Google Now on your Samsung Galaxy Note II. A visual guide on how to search Google Now on your Samsung Galaxy Note II. A visual guide on how to search by voice in Google Now on your Samsung Galaxy Note II. Discover how to search for and download an app in Google Play Store on your Samsung Galaxy Note II. Learn how to uninstall an app from your Samsung Galaxy Note II. Learn how to get directions in Google Maps from your Samsung Galaxy Note II. Learn how to turn on layers for viewing current traffic, transit lines and more in Google Maps from your Samsung Galaxy Note II. An interactive guide on how to use voice-guided directions in Google Maps on your Samsung Galaxy Note II. A visual guide on how to CHANGE S Voice settings on your Samsung Galaxy Note II. Discover how to wake up S Voice on your Samsung Galaxy Note II. Discover how to add a Twitter account on your Samsung Galaxy Note II smartphone. Learn how to tweet using Twitter® on your Samsung Galaxy Note II smartphone. Learn how to cancel the VZ Navigator® subscription on your Samsung Galaxy Note II. 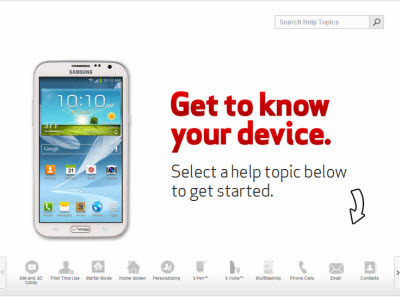 Learn how to exit the VZ Navigator® app on your Samsung Galaxy Note II. Learn how to launch VZ Navigator® with your Samsung Galaxy Note II. Discover how to navigate to a location using VZ Navigator® on your Samsung Galaxy Note II. A visual guide on how to search locally on VZ Navigator® with your Samsung Galaxy Note II. Learn how to set driving alerts for speed limit, school zones and more in VZ Navigator® with your Samsung Galaxy Note II.